What a wonderful conference as volunteer administrators from around the region gathered to explore current industry standards and exciting innovations in the world of volunteer management! Our keynote speaker was Betty Stallings, a renown author and volunteer management expert! She gave all conference attendees free access to her extensive on-line resources, a $100 value! We had breakout sessions tailored to you, whether you are a beginner in the field or a seasoned professional. We also had vendors and resources that you’ll find useful, door prizes and excellent meals! This is the not to miss conference of the year! 2015 Workshops for conference held June 26, 2015 at Bellevue College. As managers of volunteer engagement, you are often positioned in the mid-level of an organization. This necessitates the need to devote much of your time promoting your ideas, your program strategy, your needs and volunteer opportunities to staff, administration and long time volunteers who may be resisting change. In this highly interactive workshop, trainer Betty Stallings will focus on the critical skills of persuasion/influence. You will learn a process to use each time you need to persuade others to say “Yes” to your request and will walk away with a unique strategy to experience a positive response to your specific need(s) to influence others. In this workshop, we will address effective methods for recruiting, managing, and retaining youth volunteers, and address how these techniques differ from those used with other demographics. We live in a results focused time. Volunteers that engage with our organizations want to know the results of their volunteer activity. Are their efforts truly making a difference? Yet many organizations have struggled to get beyond counting the numbers and hours volunteers. This session will explore a results-oriented approach measuring your volunteer efforts. Fundraisers and Volunteer Managers play an essential role in building a nonprofit’s capacity to accomplish mission, reach financial stability, expand to scale, and achieve organizational success! Fundraising and volunteer engagement are “two peas in a pod”. There is much we could learn from each other. And yet, there exists a divide between fundraising professionals and volunteer managers in the nonprofit sector. This session will examine this divide and explore opportunities for reaching across the aisle to our fundraising colleagues to work more effectively together! What’s It Take? Acknowledging and Celebrating Our Professional Competencies! Volunteers are a unique and strategic resource for furthering our organization’s mission and vision. Volunteer Administration is the practice of mobilizing, leading and supporting volunteer activity. As skilled and competent volunteer administrators, it is up to us to ensure that volunteers achieve mission focused results and that the spirit of volunteering is sustained in our organizations. This is an inherently complex and diverse role! This session will explore the skills and competencies required to professionally manage and lead volunteers in our organizations, based on the recently revised CVA Competency Framework. At this session come and meet members of the Corporate Volunteer Council. Discuss with them what it is that makes a volunteer opportunity attractive and valuable for their employees and present your perspective on what type of volunteer activities are of most value to your organizations. Research has shown that Millenials are budding philanthropists and energetic volunteers. It’s important for non-profits to connect with this generation and build relationships now, while they’re establishing what causes will be important to them throughout their lives. In this workshop, we’ll talk about how they like to be involved, how to connect with them and make your cause their cause, and how to keep them engaged. The principles of authentic leadership give you the insight needed to bring your best self to your leadership role every day, in every situation. This workshop introduces the key concepts of authentic leadership and the tools for starting your personal journey toward becoming the leader you truly want to be. Organizations must become increasingly skilled at engaging volunteers of diverse experiences, backgrounds and talents to relevantly respond to their communities. This requires investment in creating institutional change that builds and fosters an inclusive organization. Participants will learn factors for assessing their organization’s readiness to do this and explore strategies to enhance volunteer and staff cultural fluency. Learn basic cultural concepts to view the world around you with. Learn the anatomy of conflict and the basis of synergy. Take away coaching tools to integrate your diverse volunteers. Learn powerful techniques for making organizational–and personal–vision and misson statements come alive. You will hone your vision statement to break through barriers impeding your progress. You will leave the workshop with a vision board and exercises for visualizing and capturing inspiration that fuels action and effective change. Your thoughts and vision are powerful agents of change! Attendees will participate in small group discussions with the goal of clarifying top organizational values, and discussing how we can create opportunities to involve volunteers in deeper reflection. We will discuss making volunteer experiences meaningful, by creating space for conversation about values, identity, privilege, advocacy, etc.This is good for all volunteers, but even more so for service learning students, where you may be seeking ways to tie your organizational values to their learning objectives. 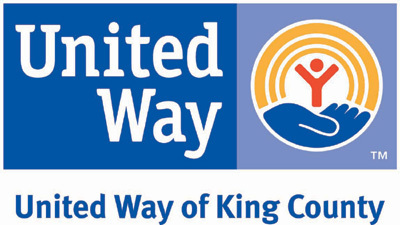 Conference was held on June 27, 2014 at the Tukwila Community Center. Theme was “Volunteer Ecosystem”. Volunteer Managers want to engage new volunteers into their organization but we often focus more on the needs of the organization over true volunteer engagement. By shifting the paradigm for how we work with and attract volunteers we can ensure long lasting relationships with new volunteers. You will get the opportunity to put this new perspective into use through scenarios and discussion. This workshop will explore the forward-looking approach of responding to diverse customers and volunteers through a pro-social-justice lens. Given that institutions shape the realities of those with whom they interact, an organization may need to intentionally invest in creating institutional change. We will examine requisite and foundational components of successful social justice initiatives. Participants will learn factors for assessing organizational readiness and strategies to enhance staff and volunteer cultural fluency. with Marjorie Trachtman of the Bellevue Police Dept. The most effective volunteer programs function as an embedded part of their organization’s culture. This workshop examines the characteristics of work environments that support volunteer engagement and the things that volunteer managers can do to build trust, support and investment in the program among executive leadership and paid staff. One of the reasons volunteer programs are undervalued is that they do not measure the volunteer impact. Most programs can tell you the hours volunteers put in and many can tell you the dollar value of those hours, but they are too often at a loss to describe what was accomplished through those hours. In this session, participants will learn how to define the desired outcomes of the volunteer program. They will then learn the two key steps to measuring those outcomes. In the session, participants will apply the information to their own programs. with Louis Mendoza of United Way with members from the Corporate Volunteer Council. The engagement of skills based volunteers reaches across the volunteer ecosystem and touches both nonprofits and for profits. Finding ways to effectively utilize this growing group of volunteers will lead to an increase in volunteers and positively impact nonprofit organizations and the communities they serve. Members of the Corporate Volunteer Council of the Greater Puget Sound will be in attendance to add to the for profit perspective. While most executive directors will say they support the volunteer program (often saying it is the life blood of the organization), their actions often indicate that it is less important than other, staff-driven activities. Salaries for Volunteer Program Managers are usually lower than other management personnel, budgets for the volunteer program (if there is one at all) are inadequate, and volunteers are often treated as outsiders rather than as equal members of the team. In this workshop, participants will explore six strategies Volunteer Program Managers can use to enhance executive support of the volunteer program. Nikki and WendiLee share why they went for their CVA (Certificate in Volunteer Administration) and how the process works. You may feel alone in your struggle to become accepted as a professional in your organization, but there are steps you can take to be taken seriously. Come and learn from these professionals. Creating value in a volunteer program goes beyond counting hours. Strategically aligning service yields results that launches volunteerism into a highly valued partnership within an organization and connects people to service and innovation. Management of youth volunteers goes far beyond recruitment. Work on strategies for engaging youth volunteers effectively, retaining them, and incorporating them into your organizational leadership. Example tools will be provided, such as position descriptions, activities/curriculum, and program applications. Share best practices and brainstorm solutions to your most vexing volunteer management issues in small groups of your peers. We’ll take the top volunteer issues and problems identified in a poll pre-conference and break into table groups to work through them in two, 30-minute segments. This is a great way to apply what you learned during conference sessions to real-world challenges. 2013 Conference at Seattle University! Our theme in 2013: Renewal! 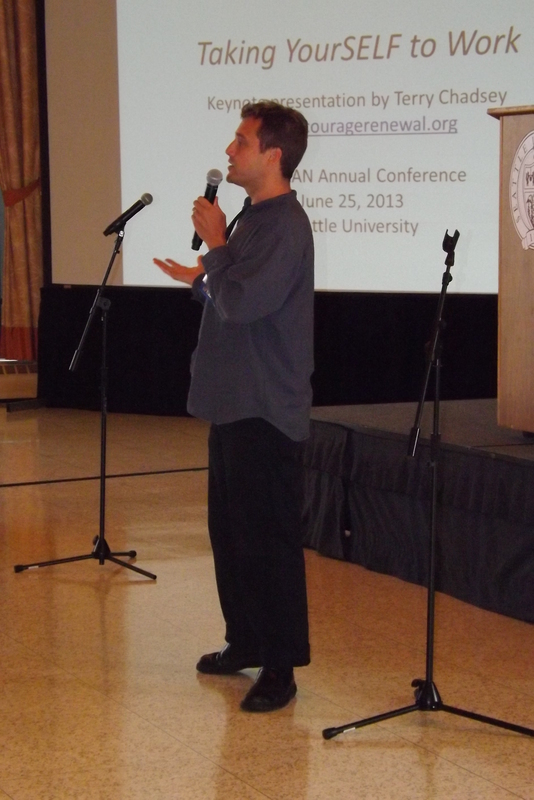 The conference was held on Tuesday, June 25th, at Seattle University. VAN was excited to host Terry Chadsey, Executive Director of the Center for Courage and Renewal, as our Keynote Speaker and workshop presenter for our 2013 Annual Conference. When you’re committed to making the world a better place, it’s vital to align your daily life and work with your core values. Our VAN keynote speaker, Terry Chadsey, will help you listen, live and lead with integrity so you can serve the world with courage. Terry will give us the inspirational start to our day, and then those who wish to go deeper can join him for a workshop. Workshop: Work that is more rewarding and fun! Terry Chadsey is the executive director of the Center for Courage and Renewal. In this video, http://moviemondays.com/mm2012/207-fully he shares something that helps staff to fully bring themselves to their work roles. It’s something he also uses to help himself show up fully to work. Terry says, “This workshop will be especially useful when facing stressful demands of leadership and in times of change.” Terry creates a context for careful listening and deep connection that also honors diversity in person and profession and will teach you to do the same. 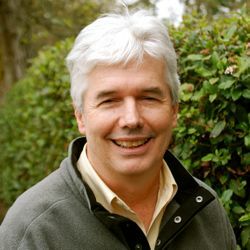 Terry Chadsey is Executive Director for the Center for Courage & Renewal (www.couragerenewal.org), an organization founded by Parker J. Palmer, bestselling author, teacher and activist. The Center contributes to a more just, compassionate and healthy world by nurturing personal and professional integrity, and the courage to act on it. Terry has a BA from Yale University and a MS from the University of Chicago. He worked as a public school teacher and administrator for thirty years. Terry has led Courage & Renewal programs since 2002. Over many years he has consulted with organizations and leaders within and beyond public schools and has presented at state, and national and international conferences. Terry lives in Seattle with his wife Jane. They are proud parents of four young adults and especially smitten with their two year old grand daughter, Teneya. We live in turbulent times, times in which the rate of change only keeps accelerating. A mind at play, especially when collaborating with others, is a mind that can joyfully & creatively ‘recycle’ whatever challenges it encounters. Come experience how to grow an agile attitude, one that will help you thrive amidst whatever challenges come your way. Participants will receive a free copy of his new ebook “The Improvisational Organization”. by Marjorie Trachtman of the City of Bellevue Police Dept. Why did you become a volunteer manager? What makes you good at it? What gets you really excited about your job? In the daily grind it’s easy to lose sight of your purpose. Rediscover why you love your work and how to sustain that feeling over the long haul. You’ll learn to spot the signs of burnout and what to do to regain balance. You’ll make use of a personality trait inventory, and compare it to job definition. The outcome will be a deeper appreciation of your leadership role and a renewed sense of purpose. Volunteer placement begins with screening: background checks and other methods are key processes by which the manager of volunteers comes to understand the motivations, needs, talents, skills, experience, background and availability of the potential volunteer. Security screening is vital to ensure that the volunteer does not pose a risk to him/herself, staff, clients or the agency at large in a given volunteer role. Together we will review best-practices for background screening; explore available methods for screening applicants including both cost and no-cost options; share resources and success stories. The degree of formality of the screening and interviewing processes varies according to the type and risk level associated with a given role. Tools and activities will be provided to help volunteer managers assess their own organization’s needs and capacity for screening volunteers effectively. We will review additional screening methods such as interviewing and reference checks. Let’s be honest: some volunteers are just difficult. They try your patience and management skills even though they do great work. Are they worth the trouble? Learn what these volunteers can teach you about leadership and how you can effectively manage them without losing your mind! This workshop will take a look at the do’s and don’ts of working with teenagers, how to engage teenagers in your program, how to motivate them, and how to communicate with them. Participants can come with their questions about working with teenagers. There will be some hands-on activities to help participants practice working with teenagers. Have you ever said, or heard a coworker say, “I don’t want to use a volunteer for this project. Volunteers are too much work!” This workshop will explore how to teach your staff the benefits of working with volunteers, how to communicate with volunteers, and how to manage and retain volunteers. Participants can come with their questions about staff engagement. This workshop will begin with a panel presentation from 3 managers of corporate employee volunteer programs, explaining the focus of their program and how they establish relationships with non-profit organizations. This will be followed by a facilitated conversation between the panel and the audience. The goal is to have the participants walk away with a clearer understanding of the perspective and needs of their counterparts in the non-profit or for-profit volunteer manager role. As client populations are changing, the need for an organizations’ volunteer base to reflect their client population increase. The workshop provides a space for participants to become more aware of the Diversity and Inclusion issues affecting volunteers of today, provide opportunities for discussion and learning for leaders to hold conversations around racial equality, inclusion, and micro-inequities in the “work place” and its effects on the client and volunteer. As a volunteer leader, do you want to convey an idea or inspire a movement? This workshop will include practical tips and strategies for communicating in a way that inspires and motivates those around you, whether volunteers, coworkers or even your own supervisor. Together, we will look at communications research and best practices and translate these ideas into practical steps anyone can take to improve their communications skills and avoid common pitfalls. order tracking and quick reorders. When styling with a level iron (or any warmth, actually), always use a heat protectant before you start styling. Sign up to receive VAN updates, event details, and to stay in touch with a network of smart and savvy Northwest volunteer managers.